Food Hunter's Guide to Cuisine: Arizona Cocktail Week: "Women, The Old Masters of Whiskey"
Arizona Cocktail Week: "Women, The Old Masters of Whiskey"
From February 14th to the 21st, Arizona is playing host to the 4th Annual Arizona Cocktail Week, a seven day celebration of the craft cocktail and fine spirits. Throughout the week, industry experts and mixologist will come through to offer their insights and showcase their skills in a series of educational seminars, parties, tastings and dinners throughout the state of Arizona. Though the celebration is spread throughout the state, the bulk of the week’s parties and seminars are taking place in the retro and beautifully lush Hotel Valley Ho in Scottsdale. A perfect setting, in my opinion, for sipping a Manhattan or an Old Fashioned pool side under the desert sky. On this past Sunny Sunday, I decided to attend one of the many seminars: “Women, the Old Masters of Whiskey”. As a woman and as a fan of whiskey, I’ll admit, I was intrigued by the name. I wasn’t quite sure what to expect––would I be walking into a boring lecture? I was pleasantly surprised. The seminar was led by acclaimed author of Whiskey Women, Fred Minnick. After a brief description of his book and a history lesson in the role that women have played in the whiskey industry, Minnick led a Q&A with modern-day whiskey women from every corner of the whiskey world (say that fast five times). The brands being represented were Canadian Club, Kilbeggan, Maker’s Mark and Laphroaig. 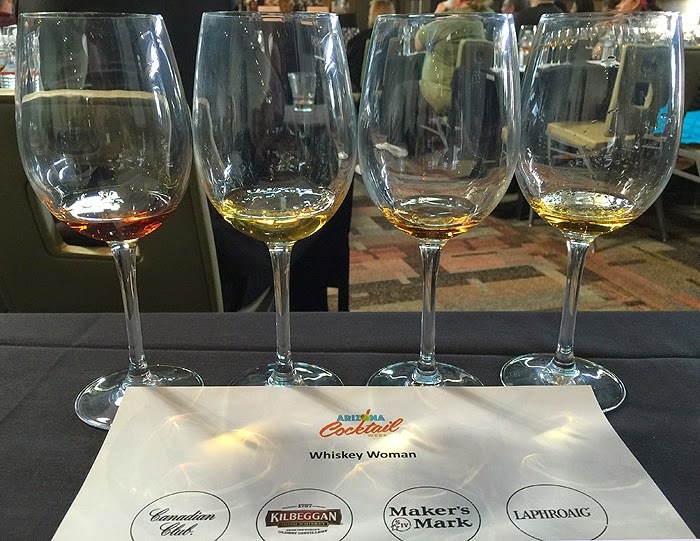 What ensued was an open and honest discussion about what it is like to be a woman in what is commonly thought of as a “man’s world” and lively talk about the craft that is whiskey making and the business behind it. I was very impressed with the four women on the panel. Their passion for whiskey was contagious and the knowledge they shared with us was fascinating. Who knew the distilling of whiskey could be so intricate and complex and that the term “whiskey” much like the term “beer” is a very broad term. The Seminar also included a tasting of whiskeys that have been influenced or produced by women. There were four glassed placed in front of everyone filled with different whiskeys. One by one, the women led the audience through a tasting of their corresponding brand. Now, I have sampled my fair share of whiskey but never have I really known much about what I was drinking. Not until today. I wasn’t expecting to be so blown away. These experts guided the audience through every note, flavor and aroma that we were experiencing as we nosed the glass and then let the sweet alcoholic beverage splash onto our tongue. Through their description of my experience, I was able to draw out specific flavors such as caramel and toffee and pick on certain scents like ocean air and smoke. It was incredible! I actually looked over to my neighbor in awe––these gals were good. Following the Q&A, the audience stepped out into a tasting panel of sorts. Drinks were being slung and beer was being poured. Vendors were handing out samples of various cocktails and it wasn’t your run-of-the-mill Gin and Tonic, these were uniquely crafted cocktails infused with cherry wood smoke or made with rare fresh fruits. I even tried my first Manhattan in the form of a snow cone! For the curious drinker and even the savvy mixologist, Arizona Cocktail Week offers an abundance of information and a lot of fun. I encourage you to attend the rest of Arizona Cocktail Week’s scheduled events, parties and seminars––you may be surprised by what you will learn or experience. Cocktail week?! Poolside?! Well, that sounds like a piece of heaven! I only know bits and pieces about whiskey distillation, so I'll be that was a really interesting lecture (not to mention the taste-testing part). You have the best times! Cocktail week? Jealous! Sounds like a great seminar! I would love to attend something like this one of these days. This sounds like such a fun event! Plus I really love whiskey and would like to learn more. What an interesting seminar! I don't know enough about whiskey and this would be a way to learn more! Sounds great! I love tasting new beverages. We did a scotch tasting not too long ago and I learned a lot! Thanks for sharing this fun post. I would have loved this! Did they explain that whiskey refers to the Irish version whereas whisky is Scotch? Hoping to learn more about whisky in the near future! Sounds like a fun and interesting event. I'm not a whiskey drinker, but I do use whiskey in a bourbon marinated salmon...and it is by far my favorite salmon recipe owed to this spirit! You are so lucky to be attending a cocktail week. I want in on this fun! I am a huge whiskey fan, and would love to be able to attend this! One of my favorite experiences was touring whisk(e)y distilleries in Ireland and Scotland, and getting in-depth tasting opportunities. It's such a complex liquor! I have actually never tasted whiskey but a seminar like this would definitely be interesting to attend! Oh, I wish I was there! My Aunt actually lives in Scottsdale and is always bugging me to come visit. I wish I had planned a trip this week! I've had plenty of whiskey but I'm not sure if I've ever taken the time to learn about it or notice the different flavor/aroma parts. I would love to go to a whiskey tasting! You're so lucky! I can't imagine how much fun this would be to attend!